We pull back the curtain on Canada's premiere music award show with lively stories and backstage moments from the people that were there. Corey Hart won Single Of The Year for 'Never Surrender' in 1985. Chilly Gonzales explains that "The human ear associates a falling melody with submissiveness" So what gives this song its defiant strength? Find out. Alanis Morissette burst on the scene with 'Jagged Little Pill' and shook up the music world. Her magic says Chilly is, "that strange yodel, that weird break in her voice that makes the vocal performance so raw and so real." In 2005 , 'Crabbuckit' was on every radio. And Gonzales points out that it uses, "a chord progression associated with some of the saddest songs in the world." In this podcast, Chilly asks, "How is it possible that it still seems like music to us when it's someone counting to four in monotone?" The secret is in the bass. Shawn Mendes won Single Of The Year in 2018, and Gonzales notes the EDM sound but Mendes also has, "the feeling of hearing a person, a true singer-songwriter." We asked Canadian master musician, Chilly Gonzales to sit down at the piano and deconstruct six of Canada's best known, Juno-winning songs. And the result? You'll hear these Canuck classics in a whole new way. In 1984, classical guitarist Liona Boyd got to take something home along with her JUNO. This is the story of how a dress made for the JUNOS found a whole new life. Magdelys Sauvigne and Lyle Crilly are members of the band Battle Of Santiago. They're nominees in the World Music Album Of The Year category. 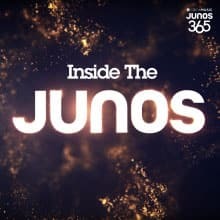 As first-time nominees, we wanted to prepare them for their inaugural trip to the JUNO Awards with lots of fun facts and trivia about the JUNOS. Play along! At one time or another, we’ve all looked into a mirror and given a mock acceptance speech. Of the thousands given at the JUNOS, there are five that stand out. Hear them now! Some say the Roman Goddess Juno is the inspiration for Canada’s premier music award show. Others cite a less romantic origin...a politician. Hear the real story. The opening monologue of the JUNOS needs to hook you to watch the whole show. Meet the husband and wife team who have written 70 award shows in their careers. They critique some of the best JUNO openers and reveal their trade secrets. It was unexpected. A group of young Vancouver rappers tuned down a JUNO. This is the story of Rascalz, and how they started a conversation about the role of urban music at the JUNOS. Where is Paul Anka ? Do Canadians like music as much as they like hockey? This was the question in 1975, when the JUNO Awards first went to air for its first televised broadcast. No one knew. The CBC was willing to give it a try, but asked the producer one thing...to land the biggest Canadian star in the world to host. This is the story of how Canada's biggest draw in Las Vegas came to host the first JUNOS, along with great moments from that show from the CBC archives. Download Where is Paul Anka ? Get a glimpse of the series that pulls back the curtain on Canada’s premiere music award show with lively stories and backstage moments from the people that were there.